Our Coconut & Papaya Infused Shea Butter is a delicate blend of nourishing Certified Organic Shea Butter, Coconut Oil, healing Aloe Vera and anti-aging Vitamin E, which delivers superior hydration and nourishment, transforming chapped, dry skin. The coconut palm has touched all aspects of daily life for millions of tropical communities. Since the 1st Century B.C., the coconut tree has provided shelter, transportation and, more importantly, food. 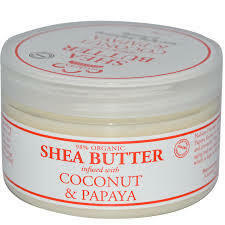 Coconut Oil, high in vitamins, minerals and fatty acids, is an excellent skin softener and protector. Papaya contains papain, a naturally occurring enzyme, used for centuries to gently dissolve dead skin cells, loosen pore blockage and stimulate circulation. No Parabens, No Phthalates, No Paraffin, No UREA, No Propylene Glycol, No Mineral Oil, No Synthetic Fragrance, No PABA , No Animal Ingredients, No Petrolatum, No Synthetic Color, No DEA.